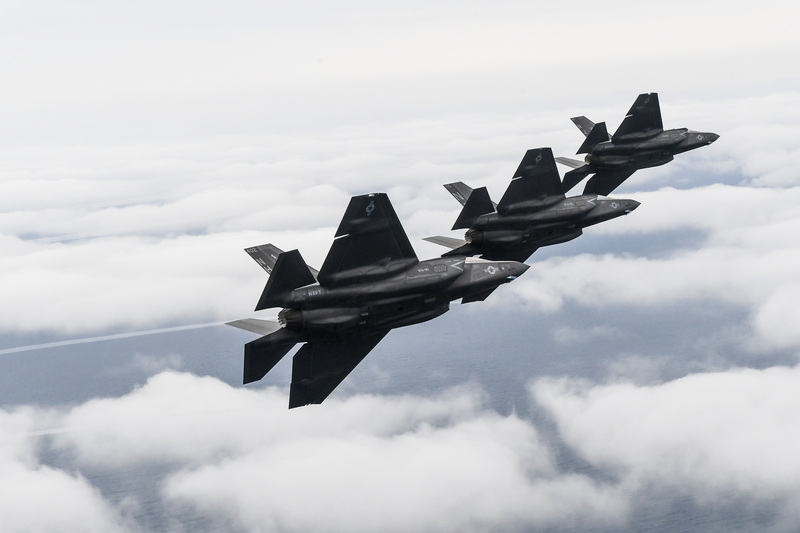 Three F-35C Lightning II — one each attached to the “Argonauts” of Strike Fighter Squadron (VFA) 147, the “Rough Raiders “Strike Fighter Squadron (VFA) 125 and the “Grim Reapers” Strike Fighter Squadron (VFA) 101 — complete a flight overhead Eglin Air Force Base in Fort Walton Beach, Fla., Feb. 1, 2019. US Navy photo. Before the Navy would declare VFA-147 operationally capable, the squadron had to prove several things, Joint Strike Fighter Wing commodore Capt. Max McCoy told USNI News in November: the squadron had to be fully manned, with all pilots qualified for shore-based operations and then carrier operations from Vinson; the pilots had to prove they could conduct a range of operations and maneuvers; the maintainers had to prove they could keep the new planes flying; and the Navy had to prove it could sustain the squadron through a mature logistics system. 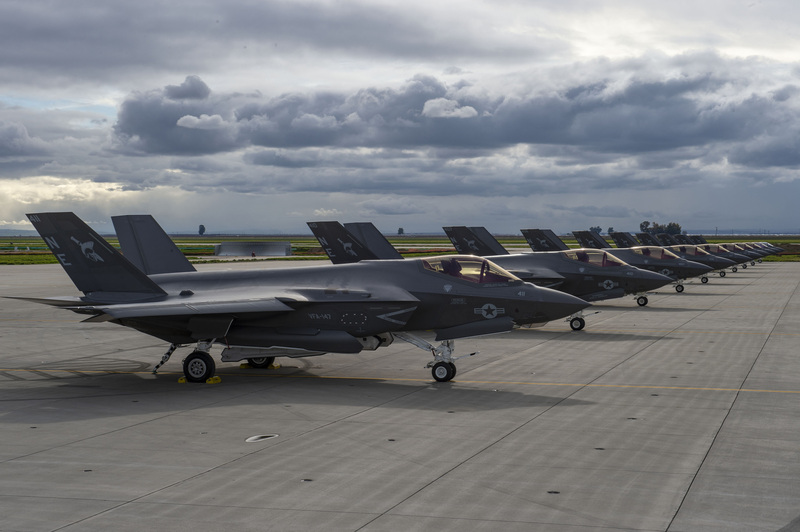 Ten VFA-147 Argonaut F-35C aircraft are displayed on the flightline here at Naval Air Station Lemoore (NASL) in celebration of the F-35C’s Initial Operational Capability (IOC) announcement today. IOC declaration is a capability-driven joint decision made by Commander, Naval Air Forces, Vice Admiral DeWolfe Miller III and United Sates Marine Corps Deputy Commandant for Aviation (DCA), Lieutenant General Stephen R. Rudder. Achieving IOC means the F-35C is available to be used in deployed environments as requested by combatant commanders. US Navy photo. “We’re very proud of what our sailors have accomplished in the Joint Strike Fighter community,” McCoy, the JSF wing commander, said in the statement. “The F-35C will revolutionize capability and operating concepts of aircraft carrier-based naval aviation using advanced technologies to find, fix and assess threats and, if necessary, track, target and engage them in all contested environments,” Rear Admiral Dale Horan, the director of the Navy’s F-35C Fleet Integration Office, said in the statement. Today’s declaration greenlights the squadron to begin preparing for the first-ever deployment with the F-35C as part of a carrier air wing – likely aboard Vinson in 2021. The Navy had hoped to declare IOC by August 2018 but had listed February 2019 as the threshold requirement, or the minimum acceptable date. The Marine Corps declared IOC on its F-35B vertical takeoff and landing variant on July 31, 2015, and the Air Force declared IOC on its F-35A conventional variant a year later on Aug. 2, 2016. 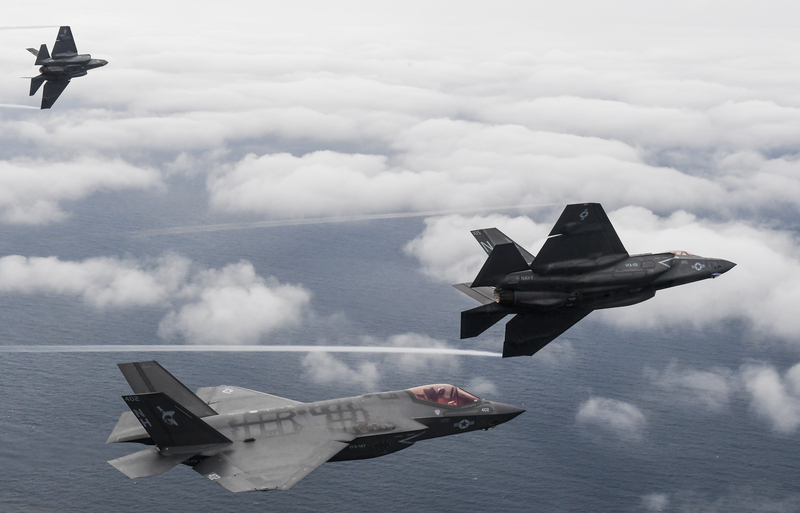 In addition to flying its own F-35B variant, the Marine Corps will also buy four squadrons of F-35C carrier-variant JSFs to operate onboard Navy aircraft carriers. F-35Cs began arriving at Naval Air Station Patuxent River in 2011 for testing, and by November that year a JSF had conducted its first ground-based catapult launch from Pax River. In 2012, the final test jets had arrived at Pax River; a carrier-landing assistance tool began ground-based testing, and the first external weapons test flight took place. In 2013 the first F-35Cs were delivered to a squadron – Strike Fighter Squadron (VFA) 101, the Navy’s F-35C fleet replacement squadron at Eglin Air Force Base, Fla.
On Nov. 3, 2014, an F-35C made its first-ever arrested landing on a carrier, aboard USS Nimitz (CVN-68). The jets then conducted 11 days of sea trials aboard Nimitz, completing Developmental Test-I with Air Test and Evaluation Squadron 23 (VX-23) and meeting all test objectives to prove interoperability between the ship and the planes and carrier suitability for at-sea operations. In September 2015 DT-II was conducted aboard USS Eisenhower (CVN-69). In September 2017 USS Carl Vinson (CVN-70) conducted its first F-35C at-sea operations, and in December USS Lincoln (CVN-72) hosted carrier qualifications for the Navy’s first nine pilots who were set to conduct at-sea F-35C operations. In August 2018, Lincoln hosted the first integrated air wing operations, where the ship’s crew launched and recovered, towed and maintained both F-35s and other aircraft types at the same time, rather than carefully handling the new airplanes separately. This integrated air wing operation used airplanes from VFA-125, a fleet replacement squadron, and VFA-147. In December 2018, VFA-147 began its bid for independence – the squadron reached the safe-for-flight milestone, which allowed it to fly and maintain the planes without supervision from the fleet replacement squadron.